Fastest Growing Shade Tree! For centuries, the Chinese have grown Paulownia, also known as Empress and Sapphire trees for beauty and for highly-prized timber. 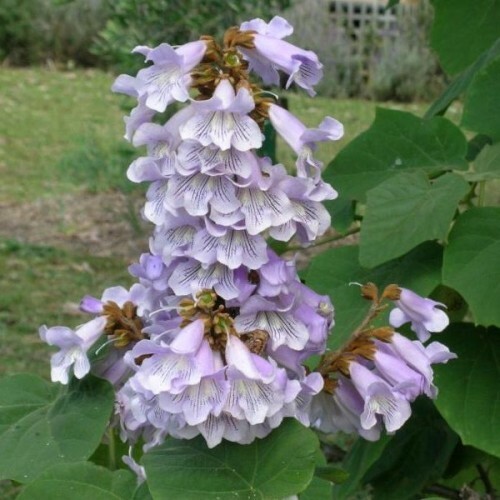 Paulownia is a fast-growing shade tree that produces a lightweight timber that is used in the making of moldings, cabinets, veneers, furniture and even musical instruments. 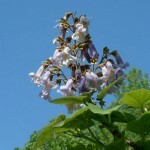 In Japan when a girl child is born, they plant a Paulownia tree for her and when she marries they build her wedding chest from the tree. They also believe that the tree should be planted next to the house so that the Phoenix would come protect them and bring good luck. Trees will not do well in overly wet soils or salt sea air. Root system: Multiple tap roots - 15 to 20 feet deep. 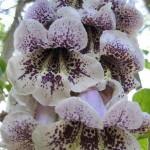 The tree is broadly columnar with thick shoots. Fragrant flowers, 4 inches long, are pale purple outside and creamy white with purple spots inside. This fast growing tree is known for its showy flowers and large, ornamental leaves. Fragrant lavender, bell to trumpet shaped flowers are borne in large upright panicles as leaves emerge. Leaves are light green and hairy, to 1 foot long. 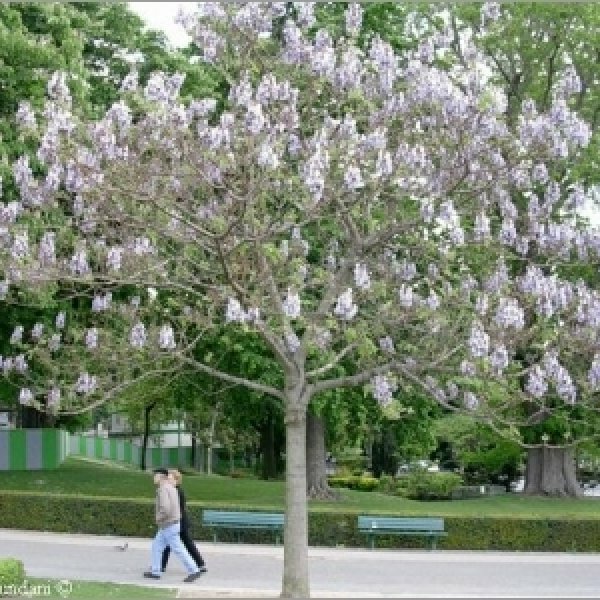 Paulownia trees may be grown in colder climates, but the tree will die back to the ground every winter. 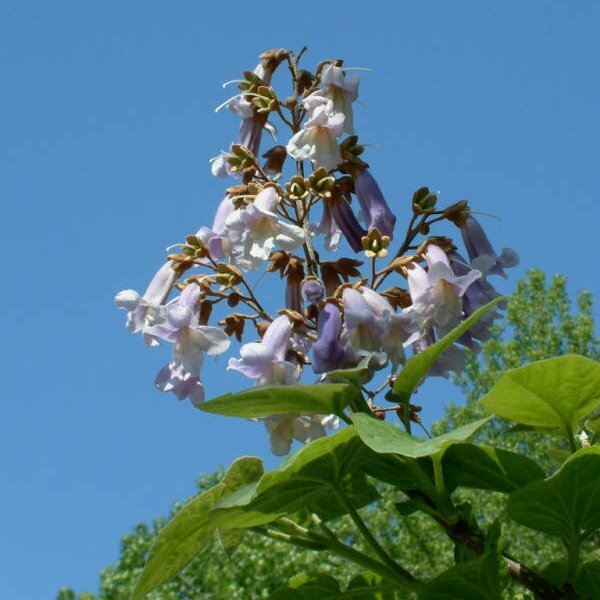 If it dies back every winter it will never reach mature blooming size, but it will still add interesting foliage to your yard or garden for the summer. Mulch roots heavily with straw or leaves in fall in climates that get below 15 degrees F (10 degrees C). Germination Paulownia seeds are easy to germinate! Germination rate will be between 60 and 90%. The average is 80%! Sow seeds on the surface of the prepared moist soil, cover with clear plastic for humidity control and place in very light (no direct sunshine) and warm (~+25C) place.